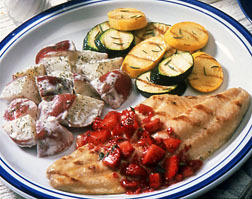 Grilled catfish with strawberry salsa. Image courtesy of The Catfish Institute. In fact, it's the fourth most frequently eaten fish in the United States. And, it's the star of ongoing studies by ARS scientists with the Catfish Genetics Research Unit, Stoneville, Miss., and their university colleagues. These investigators are intent on unlocking the secrets of the genetic makeup of catfish—the catfish genome. It’s about one-third the size of the human genome. The findings can lead to superior, farm-raised catfish for tomorrow. The scientists have already identified thousands of stretches of catfish genetic material, called DNA markers. The markers can be used in the hunt for genes that control valuable traits like larger fillets or improved resistance to common diseases. For details, contact: Geoffrey C. Waldbieser, (662) 686-3593; USDA-ARS Catfish Genetics Research Unit, Stoneville, Miss.